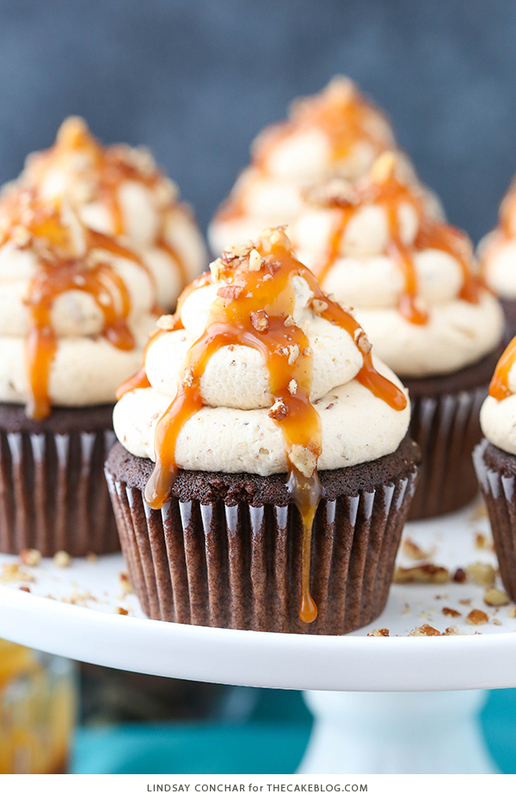 Our contributor, Lindsay Conchar, is sharing a chocolate turtle cupcakes recipe. 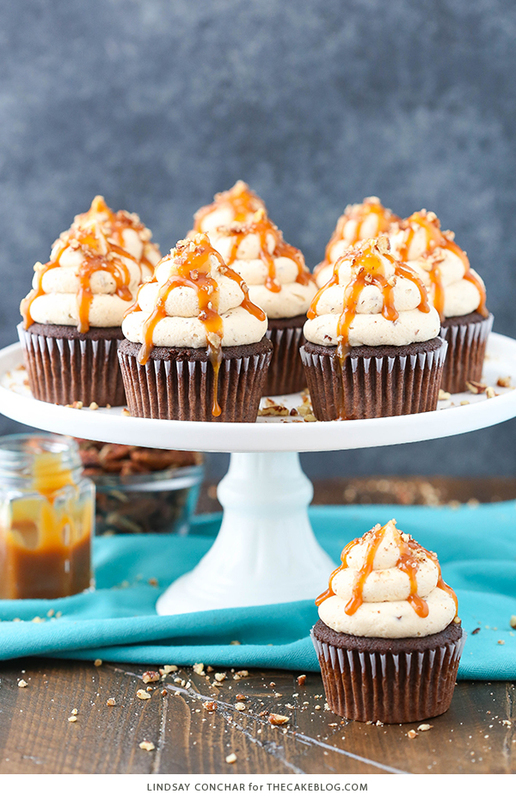 Rich chocolate cupcakes topped with caramel pecan frosting, caramel drizzle and chopped pecans. One thing you will regularly find flying around my kitchen is caramel. It’s just heavenly. I have loved it since I was a kid and will never stop. You know how boxes of chocolates usually have at least one that’s filled with caramel? That’s the one with my name on it. My grandmother was known for her love of chocolates so it was sort of a tradition to get her favorite box for just about any occasion. I always lobbied to get the big box so that there were two levels of chocolates, meaning at least two caramel-filled ones. The caramel love runs deep and I’m dedicated to it. So it makes perfect sense that chocolate turtle is a flavor combination (and candy!) that I love. I regularly find a way to get caramel into desserts, and with turtle flavor, you also get chocolate and the crunch of pecans. It makes for a fun mix of flavor and texture. These cupcakes start with a wonderfully moist and fully chocolate cupcake. I’m a big fan of them. 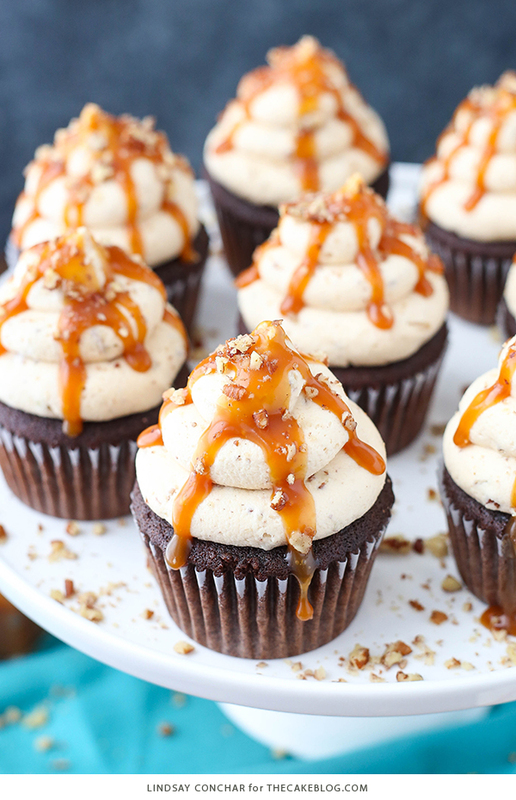 Sitting on top is the most wonderful caramel pecan frosting, drippy caramel sauce and chopped pecans. So, so good. The frosting is made with a combination of butter and shortening, which I prefer because I find it’s more stable and better at room temperature. If you prefer all butter frostings, feel free to swap out the shortening for more butter using a one-to-one ratio. I added caramel sauce to the frosting to give it a wonderful caramel flavor. I used my favorite caramel sauce, but you can use whichever sauce you prefer. 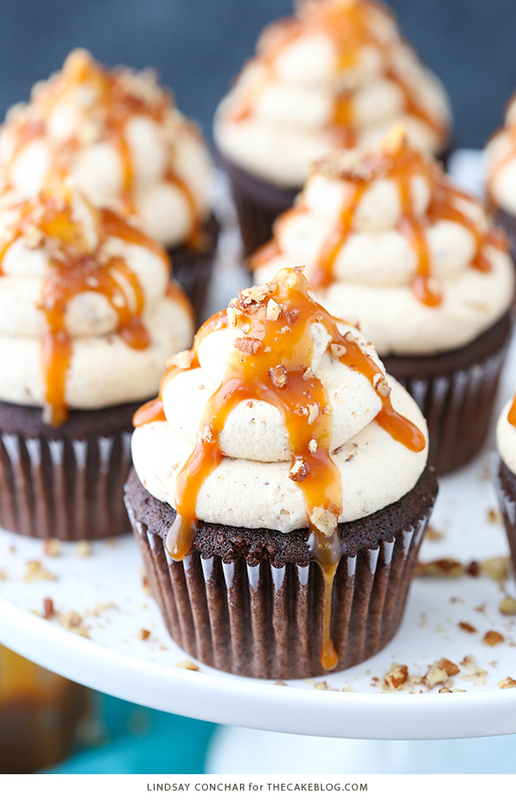 The one I used is fairly firm at room temperature and doesn’t thin out the frosting too much, so keep that in mind as you choose a caramel sauce to use – thicker will allow you to add more caramel. And more caramel is definitely better! 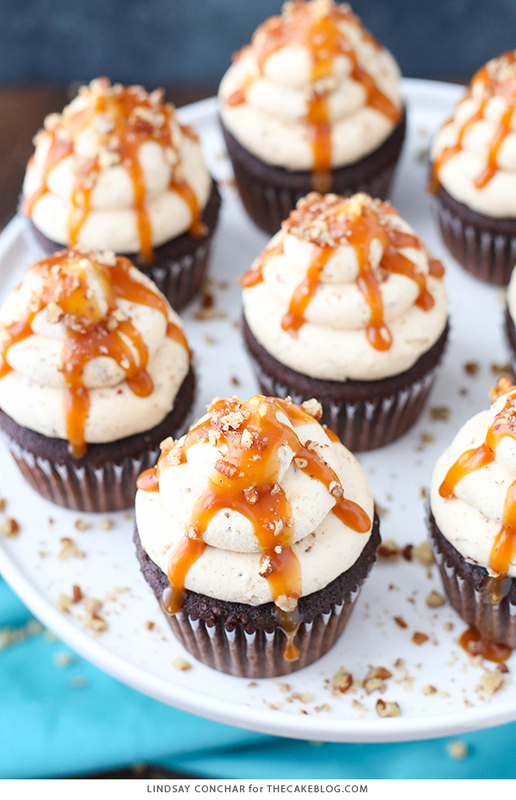 After getting the caramel flavor just right, I added some chopped pecans to the frosting. 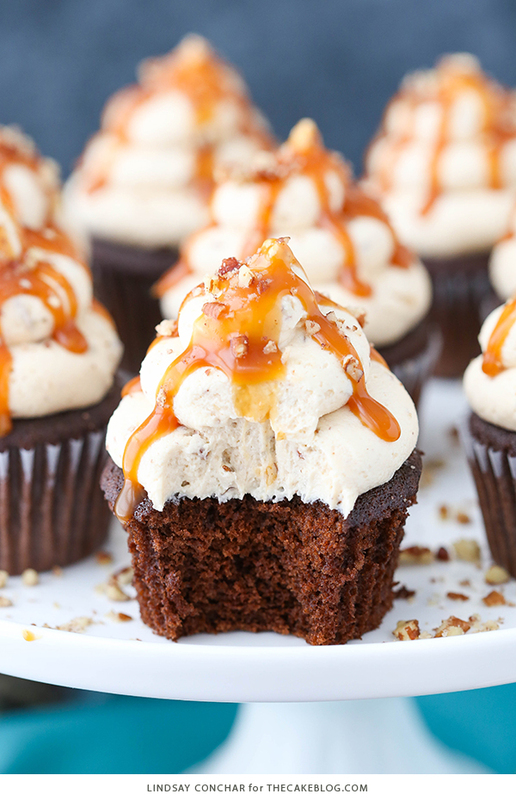 It adds just enough crunch, without being too much and taking away from the caramel. With a little drizzle of caramel on top and few pecan crumbs, they finish off beautifully. These cupcakes were a huge hit! In fact, one taster (who has tasted his fair share of my recipes) declared it his new favorite. That’s quite an endorsement! Preheat oven to 350°F and line cupcake pan with cupcake liners. 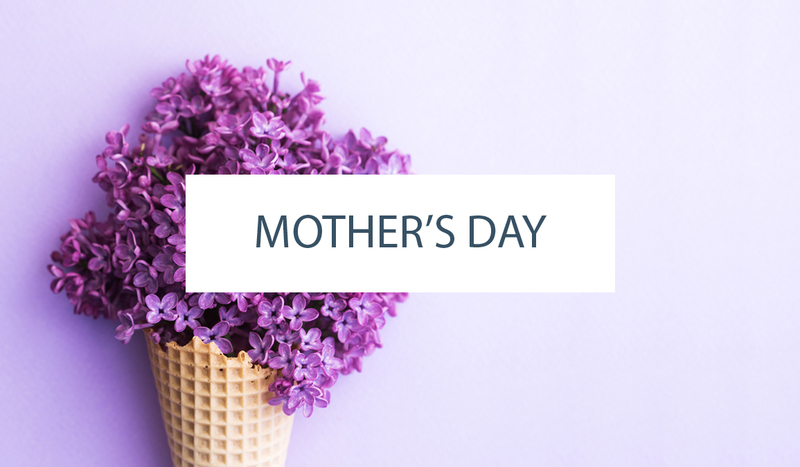 Combine vanilla, water and cocoa powder in a separate bowl and whisk until smooth. Mixture will be thick. Fill cupcake liners about 3/4 full. Bake for 15-17 minutes, or until a toothpick inserted comes out with a few crumbs. Combine the butter and shortening in a large bowl and mix until smooth. Add 2 cups of confectioners’ sugar and mix until smooth. Add about half of the caramel sauce and mix until smooth. Add remaining confectioners’ sugar and mix until smooth. Add remaining caramel sauce and mix until smooth, keeping an eye on the consistency of the frosting so it doesn’t get too thin. Add 1-2 tablespoons of water, if needed, to further thin frosting. 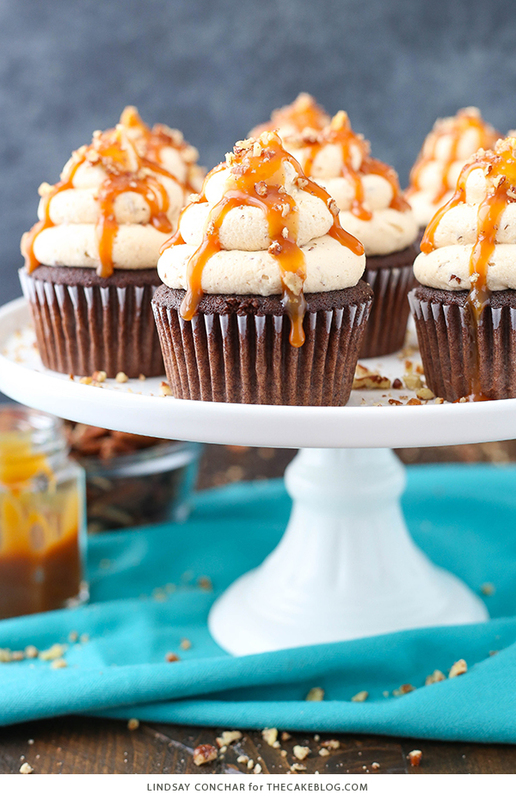 Finish off the cupcakes with a drizzle of caramel and additional chopped pecans. These cupcakes look beyond amazing! Two great flavors coming together. 🙂 And such great shots of them, as well. I hate using shortening. Could I use all butter in the icing? Sure, just swap out the shortening for more butter using a one-to-one ratio. I’m making these for our annual fair. They are for sure going to be a hit! Instead of using 1/2 cup butter and 1/2 cup shortening — use 1 cup butter only. For this recipe can buttermilk be substituted for milk in this recipe? Either way wants the difference in using either of the two in a recipe? Buttermilk is more acidic, so swapping it for whole milk can sometimes skew your results if there is not enough baking soda in the recipe to neutralize the acid of the buttermilk. The fat content is also a variable as well. You can read more about how milk and buttermilk affect a cake recipe in our article HERE. I would just like to say .. I have never made a cupcake from scratch in my life, always used boxed ugh … last night I decided to try this recipe and let me say … it was SO simple and so easy and it turned out great !!! thank you for sharing this wonderful recipe for others to try !!!!! Hello, does the butter for the cake portion need to be at room temperature or melted? Slightly softened to room temperature is fine. You could certainly make that substitution! Or using 1 cup butter only works as well!